The Public Speaking hypnosis recording helps your confidence. Everyone, at some point in their life, will have to make what might be called a public speech. This refers to speaking to small meetings of two or more people. It also includes presentations to colleagues and to clients. Let’s not forget that best man’s speech either. Public speaking can range from telling a joke to family or friends at the local pub to polished and well rehearsed speeches on TV, radio and at large public or private meetings. avoid doing it including feigning illness. If you can speak and hold a conversation with one person, whoever that person is, then you have all that you need to become a confident and interesting speaker to groups of any size. 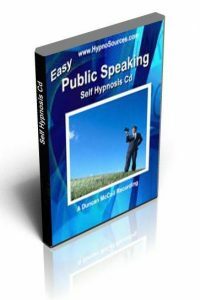 This transforming public speaking hypnosis cd will help you in many ways. Give The Speech Of Your Life!